After a week of preparing for Easter together, I feel like I should write more about how it went. I did say in the early hours of Easter morning that I was ready to celebrate, and some of you may wonder: Did you? Was it okay? Was the joy that you anticipated actually there? (Of course, some of you may not have wondered at all, but, you know, I’m into closure. So here I write). There was joy (though a little hard to muster at first) when my kids woke us at 6 a.m. and we watched them hunt for jelly beans and Lilliput eggs all around the house. There was joy every time they screamed at a new and, apparently, hilarious hiding spot (Easter eggs on the stairs?? HYSTERICAL!). And there was joy every time someone told me – in person or through a comment or a facebook message – that the blogs last week meant something to them, that they had helped them, that they had been journeying with me. Knowing that something good can come out of the hard stuff always brings me joy. But my very very very favourite was church on Sunday morning. Friends, there was JOY. 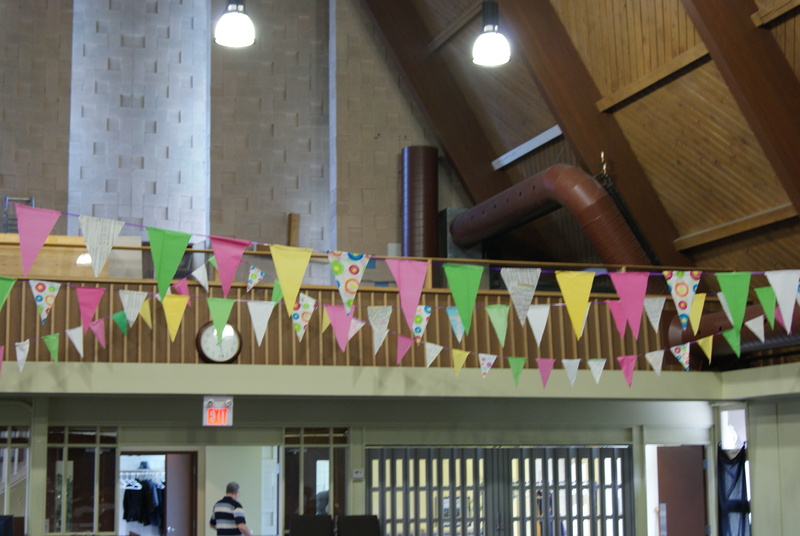 First of all, a few of the faithful had spent a hunk of Good Friday decorating for us, and it looked like a party. Earlier this year, we had decided we no longer needed the old hymnals we had been storing. They weren’t in good shape, so there wasn’t really much we could do with them. After giving a number to congregates who wanted one, we still had about 80 left. What to do with tattered left over hymnals in a power point world? I’ll tell you what we did: We made flags. 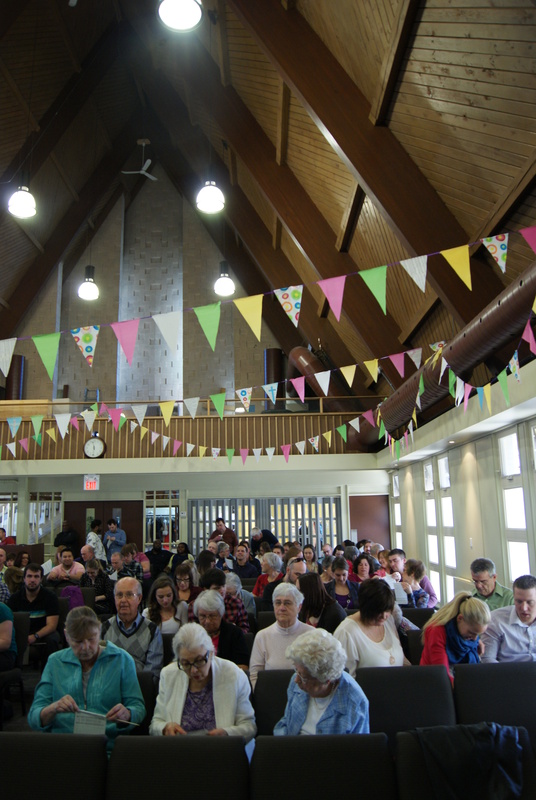 A number of the crafty (and not-so-crafty, but graciously-spirited) took the Easter songs from the hymnals and turned them into flags with which to decorate the church. And, to me, the church looked glorious. Turning something seemingly worthless into something of beauty? That’s redemption. I am so all about that. So we walked into flags. And then we started the service and tore down the black cloths from the windows. We sang Happy Day. Puppets came and gave us all chocolate bars. And then we made some more flags. We had stashed the hymnals (minus their Easter songs of course) back in the seats. In the sermon I talked about how Easter changes everything, how we could not even have the rest of the songs we sing without the Easter ones. Then we gave everyone BBQ skewers and tape and invited them to have at the hymnals. 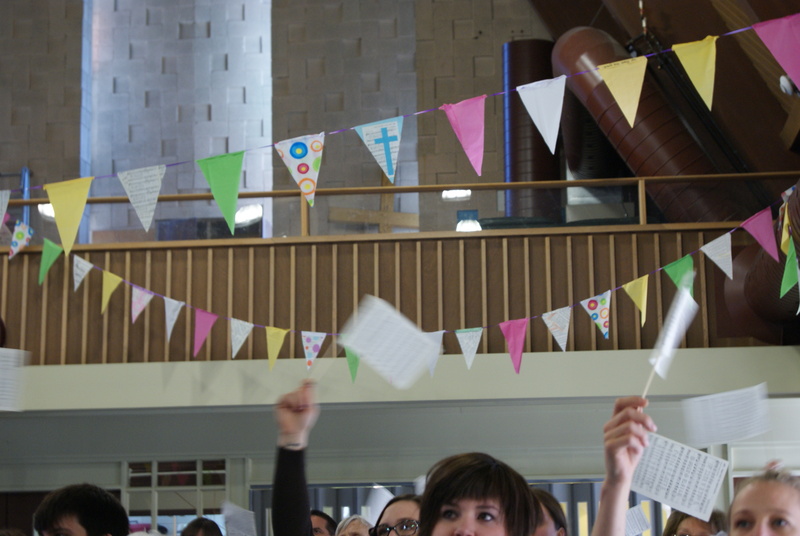 We asked people to pick a favourite song – the song that was theirs because of Easter – and make their own flag. (Here we are making flags. My church is so used to me asking them to do things like this that they don’t even seem to blink any more when I suggest these things. 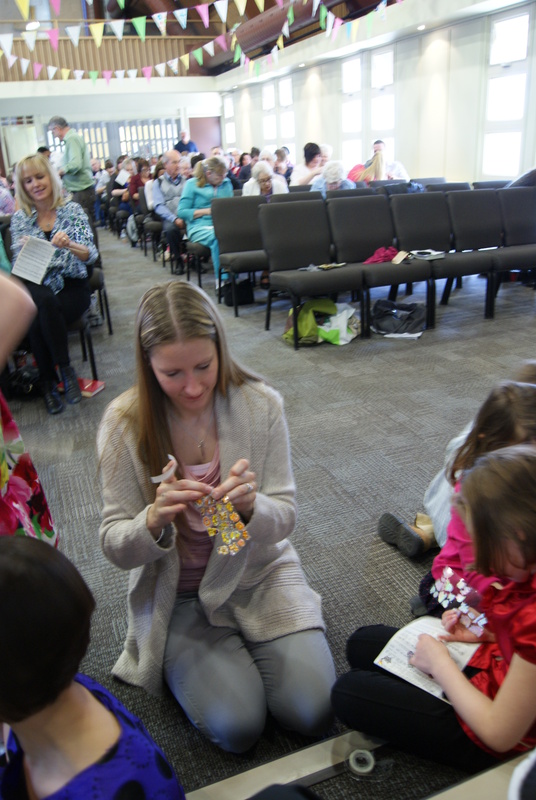 “A little craft time on Easter Sunday? Pass me the tape!” They are awesome). Now, I had planned this out, of course. And I had planned that we would close with the song “Christ the Lord is Risen Today,” during which we would invite people to wave their flags. Now, our church is not the flag waving type, so this was a calculated risk on my part. I hoped the Easter joy would bring out the flag waving side of at least a few of us. But as the activity was finishing up, the worship team started to sing “Christ is Risen From the Dead.” And you know what everyone started to do? Yeah, they waved those flags. I know, I know…I should’ve known they would do that. You give people a flag – what else is there to do? But still. When I turned around (I sit at the front) and saw what was happening I was overwhelmed with emotion. We didn’t need to ask people to stand – everyone was already standing. We didn’t need to invite them to wave the flags. The flags were already high in the air, and you know that people were waving those things with all their might. So then I ugly cried. (You know ugly crying? When it crosses over from delicately wiping a few tears in an appropriate lady-like manner to wiping your nose with your sleeve and hacky noises? Yeah, that). And I didn’t even care. All I felt was joy. I felt joy because of what God can do with a story, no matter how beaten up or broken that story may be. Because of Easter, a story can become a song. It can become a flag. And I had a very happy Easter. And so did I filled with joy. Our God is a great God! He has risen indeed. Thank you for sharing your journey Leanne. Love ya. I am thrilled for you that the flags were as important for you as they were for some of us. It was a blessing – it required time after the service to figure out exactly why I chose the flags I chose since I made 2 of them with my 2 favourites (who can choose just ONE?). It turned out to be a real gift for growth that went far beyond the Easter celebration.